My 3 years of running experience started with multiple injuries including a couple of ankle fractures. However, I still managed to complete a marathon, a 50K and a 50-miler. Even with my injuries I completed these races successfully which is why continuing to increase my distance was so intriguing. 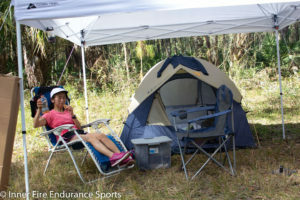 The Long-Haul 100 Ultra-Marathon race near Land O’ Lakes, Florida, was a great find as it was close to where I reside. Since the date of the race was over six months away, training time was in abundance. I contacted my coach, Brad Minus, and with his careful planning, I would build my mileage up to over 75 miles a week. While my aerobic runs were the bulk of the training, Coach Brad included treadmill hill runs along with some strength training. While I did end up with a minor knee injury, that I thought had put me behind schedule, I still ended up successfully running a ton of back-to-back long runs to simulate running on tired legs. I truly felt stronger than ever. Already completing a 50-miler, I knew that the first half of the race was not going to be an issue. There was no waiver to my confidence when I considered 75-miles either, but the last 25 miles was concerning. Coach Brad did what he could to boost my confidence, but it continued to weigh on me. Another issue I had, was nutrition. Born in Japan, I grew up on Japanese food and still prefer it, but having it available at the race aid stations was probably not going to be a reality. I wasn’t sure if I would be able to sufficiently fuel my body for 100 miles. Sleep was also a concern. As a Neurodiagnostic Technician at Tampa General Hospital, I work first shift, so I had to complete my training runs super early in the morning, therefore my normal bedtime was 9 pm. Would I be able to stay awake? I wasn’t sure. On January 19, 2019, I was standing at the start line healthy and anxious to start. I was not sure how fast I could complete the 100-miles, but I was confident I would finish under the 32-hour cutoff time. My running attire would also include a hydration vest filled with Cliff Blocks, rice crackers, water, and electrolytes. The food drop bag would allow me to refill it at the end of each 12.5-mile loop. With the sun peeking over the trees, the race started. The temperature was a crisp 60°F (15.5°C) with a slight breeze and even at 7 am it was light enough that I didn’t need my headlamp. It was sure to be used quite a bit later in the race. With plenty of company on the course, I tried to maintain a “forever pace” that I was comfortable with. The weather was beautiful, and I was feeling great. What more could a girl ask for? Feeling strong. I tried to eat/hydrate as much as I could, every 3 miles. At the end of the loop, I saw my coach set up a special spot in the hub just for me!! That was a great surprise! I was able to stretch my legs and felt like I received the royal treatment. When the time came to get going on the next loop, I was feeling brand new again. This was thanks to following the implicit instructions by Coach Brad to change my shoes and socks every loop. Maintaining my “forever pace”, I continued to feel strong despite a slight tinge of soreness in my legs. Of course, the temperature did start to rise, so I made sure to hydrate a little more, but still continuing my strategy of drinking every 3 miles. Finding fuel at the aid stations was not a problem as the plethora of food was covering the tables, but only the PB&J was calling to me. The leg soreness increased, and I started to cramp, so I added some electrolyte pills to my arsenal of fuel. It seemed to do the trick as my cramps disappeared, however, new pain in my groin area started to plague me. I was still able to run, but to make sure I didn’t aggravate it more I included some walk breaks. Later in the loop, I started to feel a little sick to my stomach which deterred my 3-mile nutrition plan. Part of the reason was I was failing to track my miles. At the next aid station, I grabbed a banana thinking it would be easy to consume. After eating a quarter of it and as I continued on the quest, I just stared at it, not wanting to eat anymore, but knowing I needed the fuel I struggled but eventually finished it. I wanted to run. I wanted to feel my legs churn underneath me with the wind in my face and my hair blowing behind me. Unfortunately, my left groin was hurting so bad. I just kept walking, praying it would go away. It did not. I was still able to do some power walking with mild pain, so that is what I did. It was during this loop that the thought of a DNF crossed my mind. Could I walk 50 miles and still make the cut-off? I just kept walking until I saw the hub 7 miles later. I rested, stretched, then started walking again. The mantra “pain is all in your head”, or something like that, repeated in my mind. I embraced it. I started running while continuing to ask myself “What pain?” and then I didn’t feel it. Oh, but I was feeling it, but I kept shaking it off and continued onward. Soon after, I started feeling like myself again. Strong. So, like Forrest Gump, I just kept running. Upon finishing that loop, I arrived back at the hub, and while resting I ate my precious rice ball. I was officially sick of PB and J. I didn’t want to even think about peanut butter. My rice ball was my savior. At 6:30 pm I started loop five. I believe it was about halfway when darkness shrouded the trail and I donned my headlamp. The pain in my groin continued, but it had diminished enough for me to continue. Strength enabled me to run more than walk as my stomach was also feeling better. When I returned to my hub spot, I was still very confident I could finish. Upon the beginning of the loop, the groin pain was more intense. I was hoping I could shake it off, telling myself it was not hurting. And I did. I was able to keep going. Prior to this time, the moon had helped to shed some light on the trail, but now it was really dark. To make matters worse it started raining. Not very hard at first, but then there were long periods of downpours. Portions of the trail were muddy which didn’t allow me to run. I continued still feeling rather strong, despite the groin pain. My stomach felt better, but I was concerned I was not eating enough. The food provided didn’t appeal to me at all. My pace and rhythm maintained toward the very end of the loop until the groin pain returned with even more intensity. Slowing to a walk, I crossed back into the hub, grabbed a cup of noodle soup, and hot chocolate. The hot chocolate felt good going down, but the noodles, not so much. The pain was strong as I started the loop. Running was extremely painful, so I began walking, hoping I could shake this off again. This time, it wouldn’t let me. As I walked, I remember, thinking to myself, even if I walked the rest of the course, the cut-off time was not out of reach. So, I kept walking. Unfortunately, the pain only got stronger and stronger and even walking became a struggle. My pace perpetually got slower, and I found myself stopping more often. The rain continued and deteriorated the condition of the trail. It was awful. At one point I slid. While trying to keep my body up, a shock of pain began shooting from my groin through to my thigh. A lot of the other participants passed me, asking if I was ok. Out of sheer pride, I said “Yes”, but truthfully, I was not. I remember looking down, staring at the ground with my headlamp light, just inching my way forward. I could no longer even lift my legs without severe pain. The combination of the rain and standing water made the grass slippery and the mud thick. As I did everything possible to continue, I would slide on the grass and a piercing scream would follow. I realized that it was me who was screaming. Not only because I was in pain but because it was dark, I was alone, and I felt defeated. This was the moment forcing me to face my biggest fear. It took everything for me to admit even though I trained so hard I would not finish. It was around 6 am when I arrived back at the hub. Apparently, it took me about 4 hours to cover (barely) 7 miles. Walking the rest of the miles was no longer an option. I was done. Immediately upon sitting down at my site, a surge of dizziness and nausea began to overcome me. The world started to darken. Realizing I was starting to pass out, I quickly inhaled some sweet tasting gummy bears. Feeling the sugar enter my system, was like someone turning up the brightness on my life and the ugliness started leaving me. I felt so bad for the coach, being my only support during the race, I did not know how to tell him I would not finish. However, he understood me 100%. I have never given up easily and he knew I left everything I had on the course. As much as I thought admitting it to my coach would be difficult, it was much harder to admit it to myself. I did not finish the race, but I still learned a lot both from the training and the race itself. It was a great experience. All the runners were amazing and the volunteers at the aid stations were so kind and helpful. My coach supported me 100%. I feel lucky just to be able to run the race. For the future, I have some ideas that I need to work on. A stronger core will help me maintain form and possibly prevent me from having another injury. Gaining more experience on trails and other uneven surfaces will provide more neural pathways to allow my body to maneuver through unchartered territories. Learn to run slower. A lot slower than I am comfortable with or find and stick to a run/walk strategy. I might have started a little too fast. At the time it didn’t seem like it but running slower, in the beginning, may have helped in the later miles. This was my first DNF (Did Not Finish) ever. However, this whole experience was priceless. I may have needed this failure in order to assure me future success. Were you ever unable to finish a race? Or unable to finish it the way you wanted?